Noritz NRC98 tankless water heaters review. Explore the NRC98 model top features, specs, and benefits. 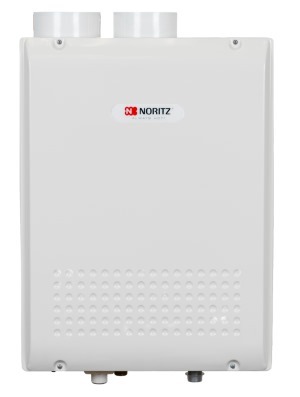 Noritz water heater NRC98 is an indoor, direct vent (DV) model that utilize tankless and condensing technology for residential water heating. The water heater can use both natural gas and propane for heating, but it requires replacement of the gas manifold and some adjustments during the conversion from one type to another. Noritz water heater NRC98 was designed as the ultra-high efficient unit, where the condensing technology provides high 94% efficiency. The superb heating performance allows NRC98 Energy Star recognition, savings and great benefits for your home. Noritz NRC98 is equipped with the commercial-grade heat exchanger, which utilizes thicker piping than other tankless manufacturers. This means better resistance to stress and longer life to the element. The water heater uses the secondary heat exchanger made of the stainless steel where water is pre-heated by the exhaust gases, therefore reducing the heating time and energy loss. As the exhaust gases are acidic, the high-quality material is used for the heat exchanger. For extracting the flue gases, model NRC98 utilize the affordable PVC or CPVC piping, as the temperature of the flue gases is lower than the temperatures found on the standard gas tankless water heaters. With the zero clearance piping, the maximum length of 62 feet and the built-in PVC adapter, installation flexibility is guaranteed. The modulating gas valve allows NRC98-DV to work between the minimum power of 16,000 BTU and its maximum 180,000 BTU. The maximum flow rate of 9.8 gallons per minute is sufficient for homes with the two to three bathrooms. The minimum water flow needed to start the unit is also low, 0.5 gpm, which makes it convenient for small jobs, such as shaving or hand-washing. Contrary to less efficient and conventional type heaters, this Noritz tankless water heater uses a more advanced ignition system, known as direct ignition. No standing pilot light means no wasted energy. Temperatures are controlled through the remote thermostat, attached to the front panel, and can be changed from 100 to 140 F, and can be switched to Celsius degrees. The temperature of hot water is factory set at 120 F.
On the remote controller, there is one neat feature called the Flow meter alarm. It is great to use if you have a bathtub. You will set the water flow, and once the set level is reached the alarm will sound, alarming you to close the hot water tap. If there is a problem with the unit, the error code will flash on the remote controller. The error codes, such as 05, 11, 29 or 90 will indicate a certain problem (improper combustion, ignition error) and allow you and technician easier troubleshooting. Freeze protection to - 30 F. Noritz NRC98 is using the electric heater automatically to prevent water freezing inside the unit. Noritz NRC98 is one of the few condensing water heaters this manufacturer offers for consumers who want more. The efficiency is high and for those who are looking for the higher capacity than what a single NRC98 model offers, the Quick-Connect give you that option, by connecting two units into one. It still provides great 12-year heat exchanger warranty. This Nortiz tankless water heater is coming from the ecoTOUGH series, a series that uses the green technology. Built as the green water heater, Noritz NRC98 uses less electricity, produces less NOx gases and once out of service more elements can be recycled than conventional tank type heaters.